Home Hydrocarbons Where Did All the Oil Go? 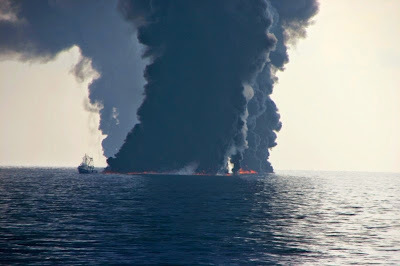 Due to the environmental disaster’s unprecedented scope, assessing the damage caused by the 2010 Deepwater Horizon spill in the Gulf of Mexico has been a challenge. One unsolved puzzle is the location of 2 million barrels of submerged oil thought to be trapped in the deep ocean. UC Santa Barbara’s David Valentine and colleagues from the Woods Hole Oceanographic Institute (WHOI) and UC Irvine have been able to describe the path the oil followed to create a footprint on the deep ocean floor. The findings appear today in the Proceedings of the National Academy of Sciences. For this study, the scientists used data from the Natural Resource Damage Assessment process conducted by the National Oceanic and Atmospheric Administration. The United States government estimates the Macondo well’s total discharge — from the spill in April 2010 until the well was capped that July — to be 5 million barrels.